Tim Tebow will start for the Denver Broncos this Sunday. In other news, the Greek economy is tanking, the Presidential election is heating up, and some guy in Libya was killed. Whatever ... did you hear about Tebow? With as much controversy as Tebow has stirred up in Denver and across the country, you'd think he was either a self-promoting prima donna or an insufferable religious fanatic. Just 23 years old with one NFL win under his belt, he already carries the hopes and dreams of millions of Brocos fans seeking a spark for a bad team. Social commentators have held Tebow up of all that is right and wholesome in America, or have regarded him with suspicion as an evangelical stalking horse. 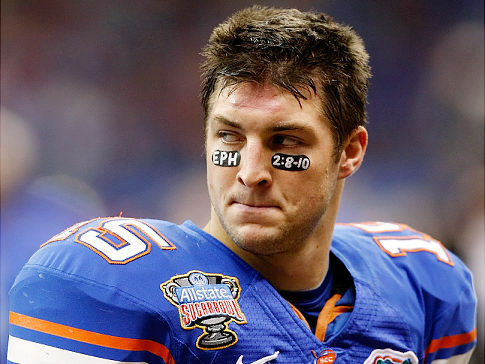 Christian attitudes toward Tebow range from pleasant good will to near idol-worship. Although he was one of the elite college football players of all time, but most football analysts doubt Tebow's skills will translate to the professional level. Can he develop the accuracy, the patience, and the quick release the pro game demands of its quarterbacks, or will his talents crumble once savvy teams develop a successful counter to his unorthodox style? Is he a flash in the pan, merely able to briefly spark a bad team and inspire a desperate fan base, or can he be the long-term answer? Time will tell, but right now Denver coach John Fox, faced with a 1-4 record, an ineffective Kyle Orton under center, and a stadium full "Tebow!" chanting fans, appears to have no choice but to give him the ball. Tebow has been a hot button on the social front as well. His parents were missionaries to the Philippines when Tim was conceived, and were at first urged by their doctor to abort the "tumor" growing in Pam Tebow's womb. Strongly pro-life, they determined to carry him to term. Focus on the Family seized on his story to make a 2009 Super Bowl commercial, which generated much smoke and fury from the abortion rights camp, although the commercial itself turned out to be very tame. His virginity has also become a talking point, provoking admiration both admiration and scoffing across the social spectrum. Meanwhile, for many evangelicals the unwillingness of NFL talking heads to believe in Tim Tebow demostrates anti-Christian bias. In short, everything about Tim Tebow seems to provoke something. These wide-ranging perceptions make it easy to forget that Tebow is, after all, still just a young man. Almost everyone who meets or interviews him is struck by his authenticity, leadership, enthusiasm, kindness, and humility. He has the appearance of a man comfortable in his own skin and with his faith, but uncomfortable with praise and unwilling to take the bait when people attempt to make him the issue. In a word, he appears genuine. Regardless, I do think this longtime 49ers fan will be quietly rooting for the Broncos this year. I will refrain from adding to the controversy surrounding him, but I will pray for Tim Tebow ... that he will continue to live out his faith with integrity. Oh, and that he will develop a quick release and hit timing routes over the middle of the field. A few weeks ago, I was talking with a high-level NFL executive who told me, based on talking directly with the Broncos, that the team's original plan was to play Tebow a few weeks for the fans, and then start with the rebuilding process. Tebow was former coach Josh McDaniels' pick and the Broncos, according to this executive, wanted to move on. They wanted nothing to do with the McDaniels' regime. However, with each win the past six weeks, Tebow -- as well as other McDaniels' draft picks -- has proven the Broncos brass wrong. Each week, Tebow has done more in the passing game to prove that he can lead a team to victory with more than just his feet. And Sunday's performance had to seal his fate as the Broncos quarterback for 2012 and on.